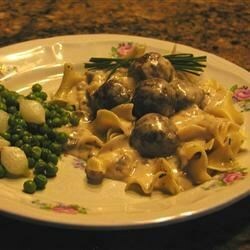 "These meatballs in a creamy stroganoff sauce will delight the taste buds of your guests. Don't let the long ingredient list fool you - it is simple to prepare and doesn't require a long time to bake. Serve over broad egg noodles or with mashed potatoes for comfort food at its best!" Preheat an oven to 425 degrees F (220 degrees C). Spray a baking sheet with nonstick cooking spray. Place the beef, bread, egg, liquid seasoning, Worcestershire sauce, pepper, and seasoned salt in a bowl, and mix well. Using about 2 tablespoons of meat mixture per meatball, form into about 40 meatballs. Place the meatballs onto the prepared baking sheet, and bake for about 15 minutes, until the meatballs are no longer pink. Remove the meatballs, place them into a large baking dish with a cover, and set aside. Reduce the oven heat to 350 degrees F (175 degrees C). Whisk the cornstarch into 1/4 cup water in a bowl until smooth. Place 2 cups of water, onion, beef bouillon granules, and 1/4 teaspoon black pepper in a small saucepan over medium heat, and bring to a boil. Whisk the cornstarch mixture into the hot bouillon mixture, and return to a simmer. Reduce the heat to low, stir in the mushrooms, soup, parsley, and sour cream, and bring back just to a simmer. Pour the hot sour cream sauce over the meatballs, cover the baking dish, and bake for about 30 minutes, until the sauce is bubbling and thickened. This rich, creamy stroganoff makes a tasty weeknight dinner. I am the submitter of this recipe. I'm not sure if I forgot to print it or if it was omitted - but I do use low-sodium products when making this recipe. Hope this helps! I used Butterball Turkey Meatballs for this, and it was absolutely wonderful! Maybe I did something wrong, but I thought there was way too much sour cream in this sauce. I won't make this again. A bit on the salty side. Will make again, but will probably use low sodium beef broth instead of the beef granules to see if it is any less salty.